As black and as scaly as any adder might be, with golden-green eyes that shift tones in and out of light. He is racer thin, cool to the touch, and has long, wavy, shimmering golden hair. His hooves are golden, he has scaled skin that is as soft as velvet. Upon first glance, you see a black horse with yellow hair. You don't think about the things he has done - the things he will do - because he is very easy on the eyes and many make the mistake of trusting him to come close to them. Only has several scars from previous encounters in Denocte, marks that were made intentionally to notify those looking upon him, of his crimes against the peoples of Novus. His right cheek as a long, thin, but deep scar that signify his career as a thief prior to this date. Around his neck he has a tightly fit thong of leather that keeps a knife - one knife - that is currently lost in Tinea swamp. Initially he hid it from Florentine when they met on less friendly terms, and he never went back to reclaim it. When worn in the sheath, the weapon is hidden underneath the spill of golden waves that fall over his left side of the neck. Only has a leathery, touch patch of disrupted scale pattern where he was bitten by a monster in a previous land before coming to Novus. There are a few feathers tied into his hair, totems from his very last kill here in Novus before he left, they seemed to be sacred in some way -- sacred to the man they were taken off of. Only has a terrible split in his being, one side being modest, meek, meandering Only while the other side (Stephen) is cold, calculating, and charismatic. They war with each other, they war with others in their social circles. Only strives to fit in, be loyal, keep friends, find interests, and to dull the edges of Stephen's knifelike personality. Stephen strives to live on the fringe, keep no one close, maintain his own interests, and to destroy Only's world so that he can keep control over his other side. Only is weak to it if only because Stephen will threaten to hurt those he cares about -- he will also continue to make Only look undesirable (which he is not) and unstable (which he is). There is a handful of elements that cannot possibly be described, only through experiencing his(their) presence first hand. There is a greater turmoil inside of Only, Florentine. Somehow both sides of this troubled mind have come to befriend her. Yet they cannot find a compromise with each other on how to share her friendship. Stephen constantly finds ways to make those distrust them so that he may isolate and control his softer side. Only, however, has a stronger ability to suppress the killer that strives to be number one. Tendencies: Secretive, unpredictable (mercurial), schizo-affective, unstable, violent, dramatic, loving, hateful, jealous, low self-esteem, and strangely? Charistmatic. Can be seen: Stealing (everything), sneaking through Tinea (looking for his lost knife), swearing (to himself), smiling (at girls, boys, and nice weapons), near a water-source (washing blood off his face), in the woods (trying to lose his shadow), practicing with knives (or using them on someone), following his 'friend' (Florentine). We are animals, we were designed to be good and to be evil. It is what separates us from Gods -- They, above and below us all, can devote themselves to such uncalibrated choices. I feel like one living on the fringe like this - when rules and laws no longer matter to me. Why? I have nothing to lose. Seriously. "Only, put the weapon down." Look at Trevor, using my name like he knows me. "This is not a weapon." I sound sharp the way Stephen sounds sharp. The Marakov in my possession is the replacement for Winona, who has been lost. "This is a tool for which I weight my wallet(s) with. This is my tool." I say. I can't believe it, Miranda is mine? Mine, the way Winona is Stephen's. "Only! Stop swinging her and get inside the circle, we gotta go." Oh, we robbed another dragon of its cache. This time Trevor, my hostage, insisted on helping me. 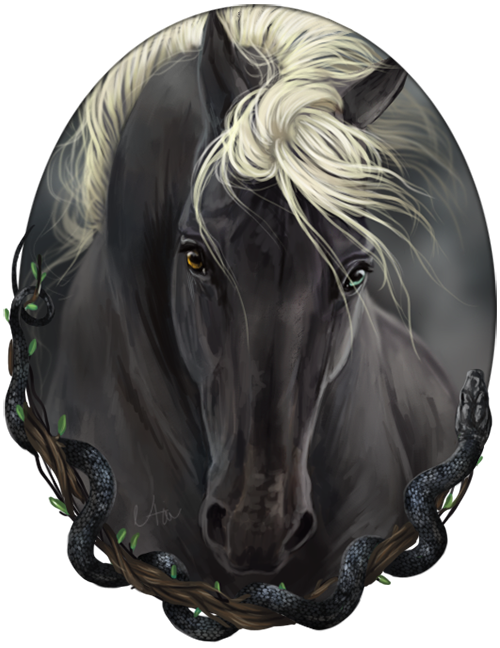 Previous History(ies): Tumbling through outer space, drowning in oceans, being chased by plagued blood-thirsty horses, reasoning with rabid dragons, killing girls, killing boys, killing Time, and of course being here, in Novus, following his troope of Rift-riders. Last seen: In Ruris, in the woods, stalking an old horse that his alter-ego believed to have stolen a precious knife. No rumors have survived the incident but the truth will be released once he comes back to Terrastella to find Florentine and confide in her about his terrible terrible mistake. Blood, rushing like wild rivers in my ears could not drown out the sound of his drums. The old wretch had it coming, honestly. Wait, did I think that? What? Nothing actually. Nope. Nothing at all. So then, why is it haunting me? Why is he following me through the keyholes in my dreams? Dreams? Dreams! Are they dreams or visions of the past? My past? Mine? Mine or Stephen’s? Who killed the old man? Me? Did I do that? No -- -- Well, not really. Stephen’s laughter is like poison in my veins. Icy, prickling, creeping, crawling. Heroin. Sibilating, never ending, always with me, just like those drums in my sleep. Every damn day of our waking, suffering, and sometimes slumbering minds. LIke Stephen, those drums are always with me. Where did you lose her? Is this my fault? Did this happen because of me? I lied -- I know I did -- I always do. I lie because Stephen always tells the truth. The truth gets me no where. Lying doesn’t either. Lying did not help when I lied and told Stephen who took her. I lied when I said it was the old man on the avenue -- the medicine man who played his drums on the street corner, the one with the birds in his hair. I remember that I told Stephen I liked the old man’s feathers. Then I went to sleep in my house. I woke up outside in the field just outside the woods, and that is when I realized I had to leave town immediately. To vanish - into thin air - like cigarette smoke -- like blood down a drain. Vanish like Winona did. Through the veil of here and not here - from there to nowhere. To no one’s knowing. Into the Beyond of Stephen’s vicious paradise. Part of me relished in the not-knowing. Part of me delighted the way Stephen often did, in the fear that I could taste in the edges of his bitter panic. And what is better than this? What? I wonder. We never go back to the places that we bleed in. That was Stephen’s rule. We always move forward - always. It is forbidden to look back over my shoulder. But this time - we go back. We go back to get the knife. Stephen's rule. Above all things, we never leave Winona behind. Enchanted Weapon assuming it is approved by staff. This 12 inch cold steel tanto knife will be disguised as a steel horn coming out of his head with an Illusion Enchantment .. hopefully. I also do not wish to disclose my discord information if that is alright with everyone. Thank you. This art of Only was done by Naia on DeviantArt.